David Punter is Professor of English and Research Director of the Faculty of Arts, University of Bristol. His major publications include The Literature of Terror: A History of Gothic Fictions (1980; two-volume new edition 1996); Romanticism and Ideology (with David Aers and Jonathan Cook, 1981); Blake, Hegel and Dialectic (1982); The Hidden Script: Writing and the Unconscious (1985); Introduction to Contemporary Cultural Studies (ed., 1986); William Blake: Selected Poetry and Prose (ed., 1988); and The Romantic Unconscious (1989). ‘Rapture’: The act of seizing or carrying off as prey or plunder; the act of carrying or being carried; and the expression of ecstasy or euphoria in words. 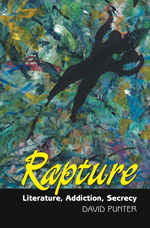 The concept of rapture in literature navigates along a specific trajectory, from rapine status through to ‘being carried (away)’. This book identifies the apparent impossibility of recounting such ‘rapturous states’, and of fixing them in words or in time within cultural expectations, while questioning what we can do with those who are ‘enrapt’, and what we do inside ourselves with reading moments of rapture. Rapture: Literature, Secrecy, Addiction engages with the ‘states of heightened awareness’, and seeks to connect with the notion of addiction as an alternative to the moral law. Punter deals with notions of writing as itself a kind of ‘seizure’, writing as a ‘fit’, in the works of Blake, Hölderlin, Novalis, Nietzsche, Fitzgerald, Faulkner, Genet, and Ballard. ‘Writing it down’ – the process of returning from states of exaltation to find oneself writing in often bleak locations, underlines the relationship between rapture and literature. The author concludes that the very possibility of communication and interpretation is radically open to doubt. The addict–writer becomes representative of the dialectic of writing as an act of communication; an act which is tragically doomed from the outset. Is there an Emperor in the Audience? We Move in Delusion as the Night . . .
How Many Junkies does it take to . . . ?